As I said before, this story is one I wrote YEARS ago, before SuperFogeys Origins even existed. 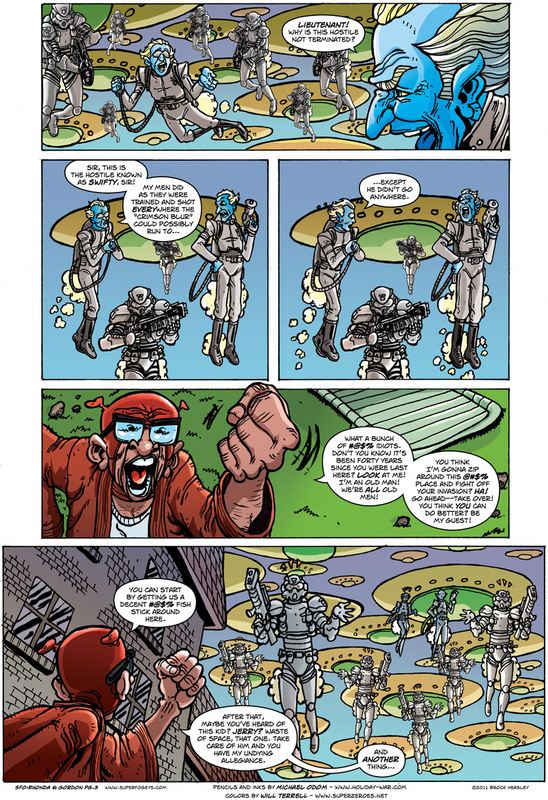 I always lamented the fact that it didn’t get made–mostly because of this page. It’s one of my favorite Swifty moments and something I guarantee you’re not gonna see in a Flash comic anytime soon. Michael Odom and Will Terrell outdid themselves on this page, particularly that panel of Swifty yelling. So great. Thanks, guys! In case you missed it Wednesday, a van ran into my house. And my car. Been a bit of an insurance nightmare since then, but I’m happy to report that we now have running water again and our car is in safely in the shop being repaired. Next on the agenda: figuring out how much damage was done to the house. One step at a time. Seriously, people, drink a Coke if you have to. Don’t get me wrong, Coke is in no way good for–no caffeine is–but better that than fall asleep at the wheel. There just wasn’t any need for this to happen in the first place. MONDAY and WEDNESDAY – I hesitate to reveal too much, but suffice it to say Jerry and Spy Gal have A LOT to talk about. FRIDAY – The Ballad of Rhonda and Gordon, pg. 4 – We finally meet Rhonda!